Remove and discard glaze packet from ham or reserve for another use. 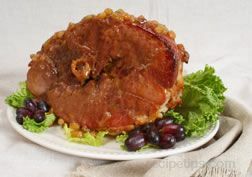 Prepare and bake ham according to package directions, removing from oven 30 minutes before the end of baking time. Uncover; brush with the Orange and Ginger Glaze. Pour ginger ale and 1/4 cup orange juice into pan. Increase oven temperature to 425°F. 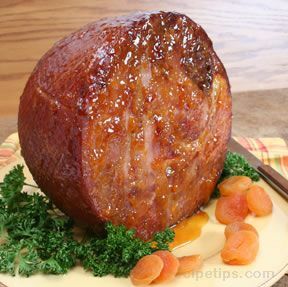 Continue baking ham, uncovered, 30 minutes, basting with the pan juices every 10 minutes. Make Glaze: Mix marmalade, ginger and mustard in small bowl until well blended. 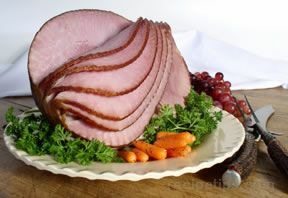 Remove ham from oven; loosely cover with aluminum foil. Let stand about 15 minutes. Make Sauce: Meanwhile, beat cornstarch and 2 tablespoons orange juice in small bowl with wire whisk until well blended; set aside. Pour pan juices from ham into small saucepan; stir in sugar. Cook over medium-high heat 1 minute, or until mixture comes to a boil. Add cornstarch mixture; cook 1 to 2 minutes, or until slightly thickened, stirring constantly. Remove from heat; cover to keep warm. Carve ham. Drizzle with the Sauce just before serving.